His first email grabbed me from the start and each successive letter was filled with the spirit and sass of a 20 year-old. His infectious sense of humor and a heart as good as gold told me that this was no ordinary man. I was correct. He jumped into the forum right away and quickly made many friends. 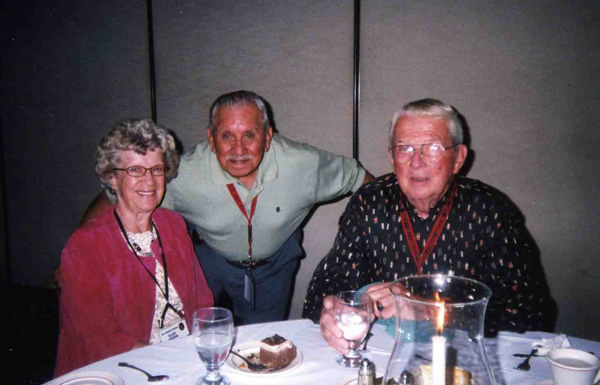 In September he becomes president of the Red Bull Association and will proudly represent all his buddies past and present at this year's reunion, Sept. 8-10, 2006. Wish I could be there to meet you and all the other members of the 34th. Rocky and I recently applied for membership into the Anzio Beachhead Association, and I will be honored to have my name next to his as a daughter of an Anzio veteran who fought side by side with those tremendous Red Bulls. He highly recommends a book on his unit that I read two years ago called, Dogfaces Who Smiled Through Tears In World War II - Homer R Ankrum - Graphic Publishing Company. When I asked him if I could mail my copy to him so he could sign it, he replied, Maid Marion, I'll do ya one better; and he exchanged his copy with me, complete with a personal note and signature from the author, and a notation from Rocky himself. I was very touched by his generosity and kindness, and it now holds a very special place on my shelf and in my heart. 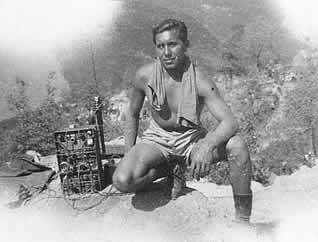 ROCKY SERVED IN NORTH AFRICA AND ITALY WITH THE 135TH INFANTRY REGIMENT, 34TH DIVISION FROM MARCH 1943 TO OCTOBER 1945. 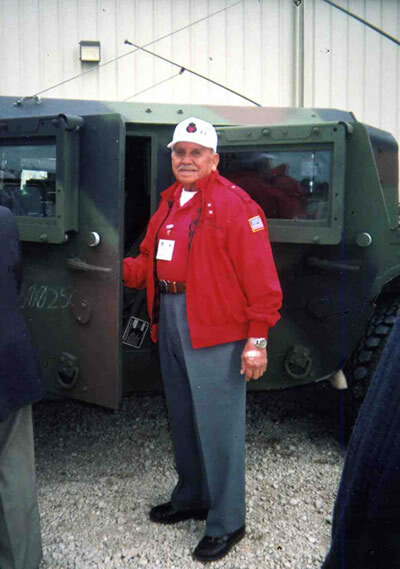 HE WAS AWARDED THE COMBAT INFANTRYMAN BADGE, BRONZE STAR, PURPLE HEART AND EUROPEAN-AFRICAN-MIDDLE EASTERN THEATER MEDAL WITH 5 BATTLE STARS. ... My name is Roque J Riojas. I have been invited to join this site by j3rdinf. I am an 83yr. 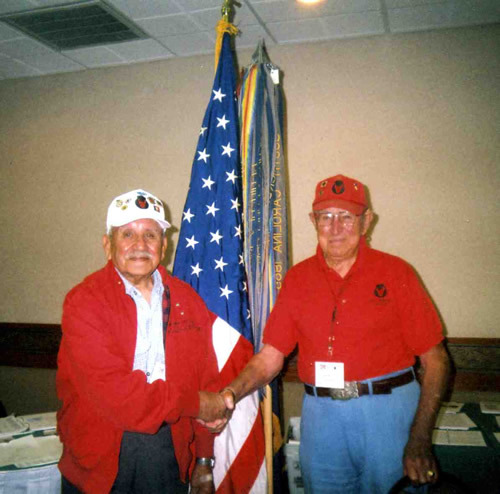 old WWII veteran and liifetime member of the 34th Div. Association. It became an Assoc. when it was deactivated in '46. I was with the HQ. Co. 1st Bn. 135th Inf. Regt. The 34th Div. 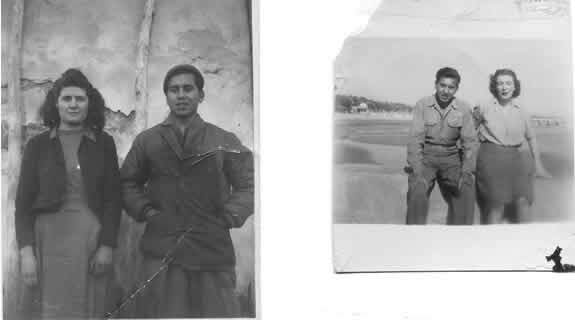 went into combat Nov. 7, 1942 at Algiers, North Africa, and attached to the Div. 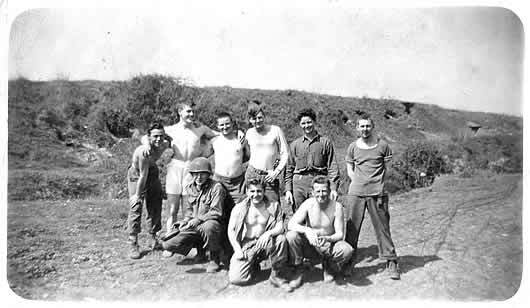 was the 109th Combat Engineers. 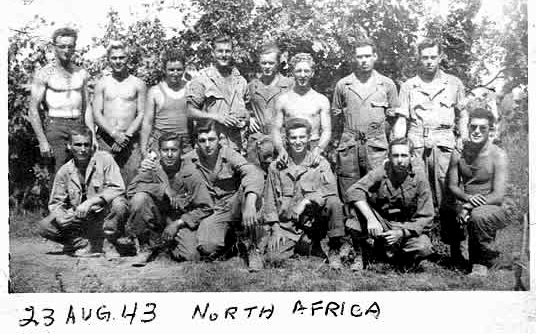 They stayed with the 34th thru N. Africa and part of Italy, and were also used as combat infantry! 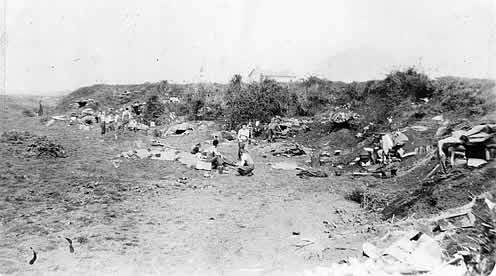 Several battles: Algiers, Sened Station, KASSERINE PASS, Fondouk, Hill 609, and after that the Germans were on the run. It ended around April or May '43. 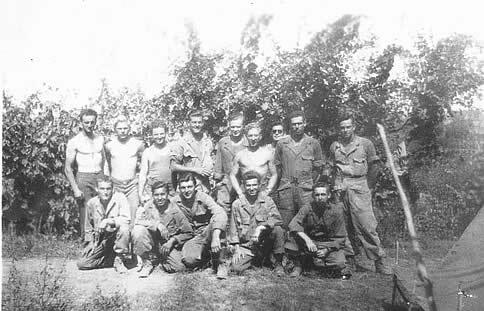 Took amphibious training for the assault at Salerno, Italy Sept. 9,'43. Then it was hell all over again till May 1945! The 34th Div. amassed more than 600 days of combat in the two campaigns. Thru all of this I thank God Almighty for bringing me back home. 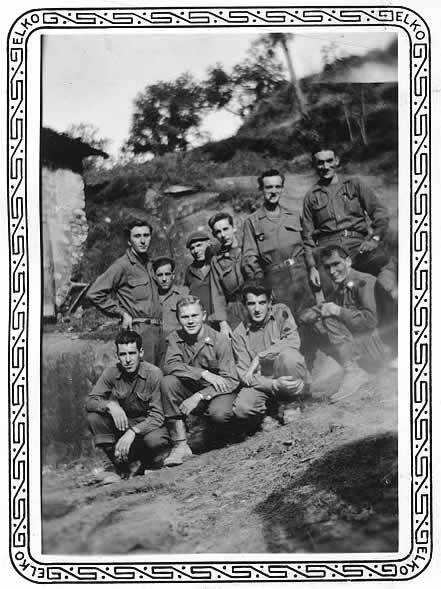 I have a chronicle put out by the Army Archives that tells about the 34th Div. It's quite long to write it but I could send a copy to Joe (3rdinf) maybe he can paste it all I have is a laptop and a printer. Anyway this is a short summary and if you noticed I never said I did this or that, it was WE the RED BULL DIVISION, which did this. 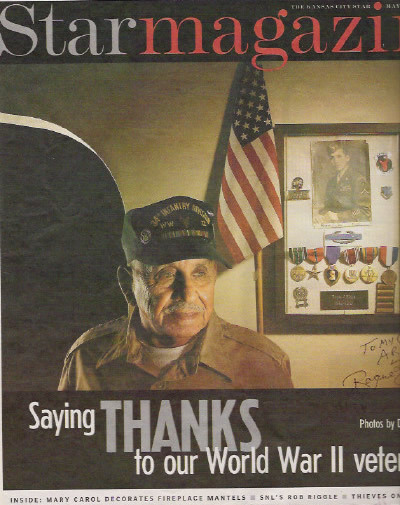 Roque Riojas a proud WW II combat infantryman. ... Joe: I think that the 34th was a forgotten Div. Kinda like No. Africa was a forgotten front. I Guess we weren't recognized like other divisions like the 1st (Big Red One), 3rd, 36th, 45th, 1st Armored, or 10th Mt. Joe I am happy you didn't see action in Italy. Those mountains are kinda high. Marion's Note: This is a reply to Custerman on our forum. Marion's Note: In response to Joe's trip across the Atlantic on the Queen Mary, and how they opened their rations with a P-38 (can opener). Joe, you got that right, I forgot those things we used going to No. Africa. How long did it take you to get there? It took us 14 days, on a zigzag course with the navy dropping depth charges. What a sight watching the water come up like a geyser. And we did carry the P-38 on our dog tags. Hey Joe, what about t/paper in our helmet liner, and at night on the back of our helmets held by the strap so the guy behind you could see you. Bring back memories Joe? War was hell and still is. April 3 - Ol' swimming hole - Depth 6" in some places - ha-ha! PDHINKLE: You were in a good outfit. The roughest time the Texas Div. was when they reached the Rapido River. The Germans flooded that river to keep from getting crossed. I salute the COMBAT ENGINEEERS, for they got across under fire and strung cables so the inf. could cross. Anyway the Germans were way up on high ground looking down and let almost a Reg. cross then they opened fire. Guess what happened? We were in another sector but word got to us that that evening a lieutenant went across with a white flag so the Germans came down and he asked for permission to pick up his men. 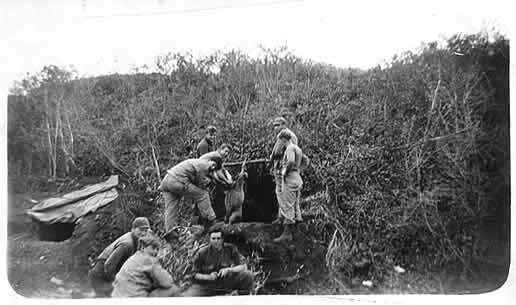 The Germans called for their own medics to help and a truce of 6 hours was called to take care of the wounded and kia's. This is what WE heard about the 36th Texas Div.!!! I would love to go to Italy and visit some of the U.S. cemeteries there, or talk to someone that has seen them. 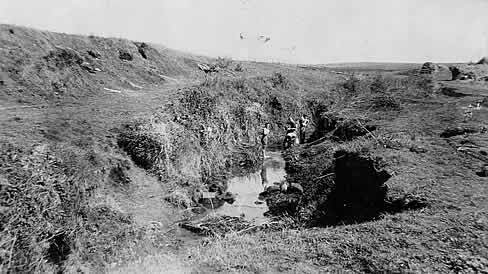 We had better luck crossing the Volturno River three times. And yes we lost some. Goat that was killed with an M-1. Better than C-Rations! gondola ride but I don't remember where we were bivouacked. We only had a day's time there. 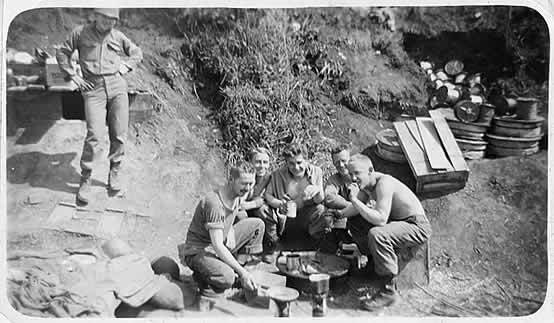 I remember having wine with our c-rations! I gotta tell you a little story about one of the NICE times I had in Italy. We had just got back off the line and pitched our pup tent when my buddy Kenneth Ryan said, Hey-Riojas, remember where we saw that bunch of chickens back there? I said yeah. Well go get one and I'll go over to the Mess tent and I'll borrow a skillet and stuff and we can eat chicken. I said how the hell am I going to get one? All he said, "You got an M-1 doncha?" Needless to say I came back with one. And he was waiting for me. So I said how the hell you gonna clean this thing? He said just hold it by the legs. WITHIN 5 MINS. HE HAD THAT CHICKEN SKINNED, ALL I COULD SAY WAS 'DAMN' AND HE ANSWERED, WE DO THIS IN OKLAHOMA ALL THE TIME. We carried a little Coleman stove took one of my canteens marked gas, filled up the stove while he cut the chicken up and boy did we eat. Course he also got fixins fer it. Just me and him had a feast. 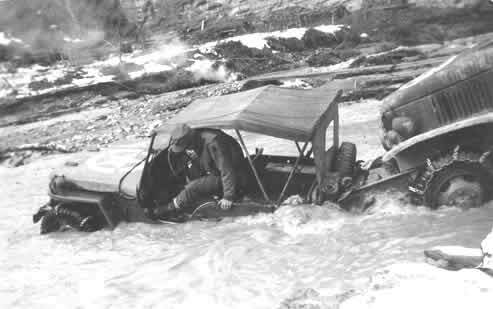 I think this was the summer of '44 still in the mountains. AND THE WAR WAS TEN THOUSAND MILES AWAY!!!!!!!!!!!!!!!! One of my rare nice moments. As far as battle stars, man too numerous to mention but the battles were made into campaigns and as a result I got five of them. The town of Cassino and Monte Cassino, Anzio, Bologna, and I haven't even mentioned all the mountain fighting. The 10th Mountain was on our right flank. 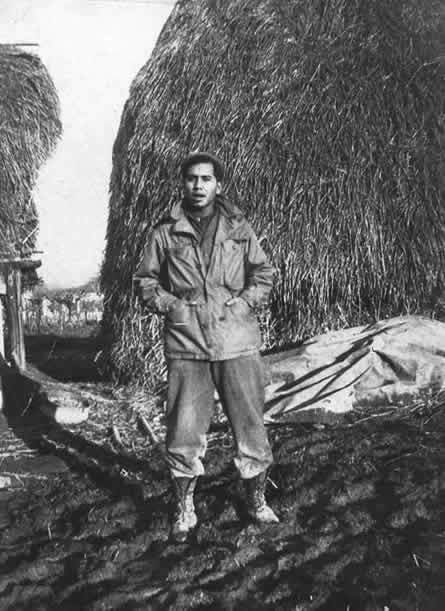 And I salute Senator Bob Dole of the 10th. Mt. Div. They all wore white parkas and helmets; I tried to get a parka but no luck. 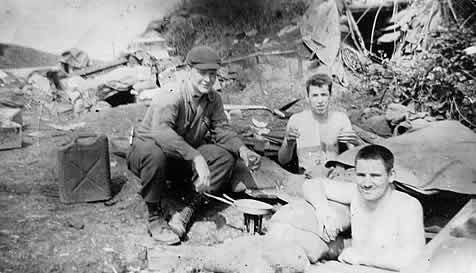 Another thing, on Christmas Eve, of '43, we relieved the 36th Div. at St. Pietro. So damn many mountains and cold, cold, cold. Two pair of woolens on and a blanket. For water we melted snow. Mule trains were slow in getting to us. took of me by a haystack (see below) the morning we came off the line. Don't ask what I did behind the haystack but I had a trench shovel. Boots and halfway up my legs still covered with mud. And I think shortly after that the Lt. came by and handed me my C.I.B. That is my most prized possession. And yes I have it in a shadow box along with some other medals. ...TALKING ABOUT THE LONGEST WINTER, ANY COMBAT INFANTRYMAN HAD THE LONGEST WINTER. MINE WAS WINTER OF '44 UP IN THE MOUNTAINS OF ITALY. LOT OF PATROL DUTY. COLD AIN'T THE WORD. RATIONS WHENEVER THE MULE TRAIN GOT THERE. EVERY MAN SUFFERED HIS OWN WAY. showed up and surrendered his troops. That day we, (135th Inf. Reg.) called it the TWILIGHT OF HELL, FOR THE NEXT DAY WAS THE DAWNING OF PEACE. I don't think there is a memorial there. A total of 20 months combat in Italy. ... The 88th I.D. relieved the 34th AFTER the war ended and took up the occupation. 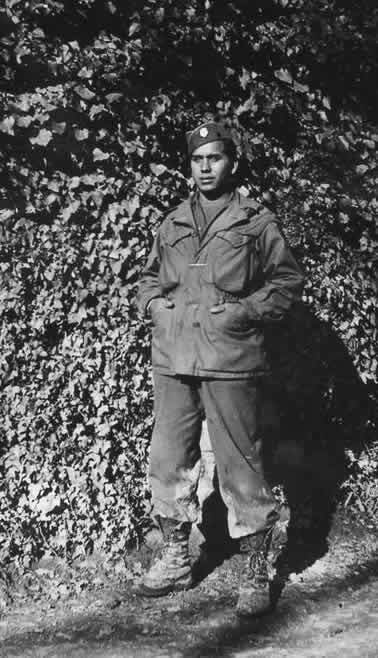 In Nov. 1945, the 34th RED BULL Div. was sent home and NO ONE was there to greet it. I was greeted by one man I ran into just 3 blocks from home. That was my welcoming committee. airline and change your departure date for Mon. pm. I called and the clerk said sure but it will cost you $175.00. I said why and she answered company policy. I told her why I wanted it changed. She said, wait a minute. When she got back on she said she talked to the general manager and told him why I wanted to change, and he said waive the $100.00 and just charge 75.00. So I TOOK it. Anyway Monday morning at 7am I was driven to the White House, and lo and behold there was Colin Powell and a couple of 4 star generals met them and had a pic taken with Colin Powell. Then we had a continental breakfast. It was time for the President so a short line was formed and when my turn came a female Marine called out my name and I entered the Blue Room and there they were. President Bush walked towards me and he greeted me then we walked to the center of the room and he introduced me to Mrs. Bush and I got as close as I could to her (check where my left arm is). So we talked a little more, then I excused myself with a smile on my face. They sent me the official White House Photo! Proud moment for Roque Riojas. Memorial Day. The interview was printed on another page. The following was an article that ran in the Kansas City Kansan on Thursday, February 15, 2007. 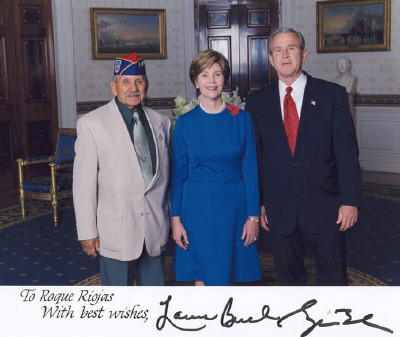 The article including two photos that are featured elsewhere on this page; Rocky at the age of 23 in uniform, and Rocky and President Bush and First Lady, Laura. Roque Riojas is a Kansas City native. His school days were spent in the Armourdale area. First, John J. Ingalls grade school, then Central Jr. High School, followed by one year at Argentine High School and then Wyandotte High School. 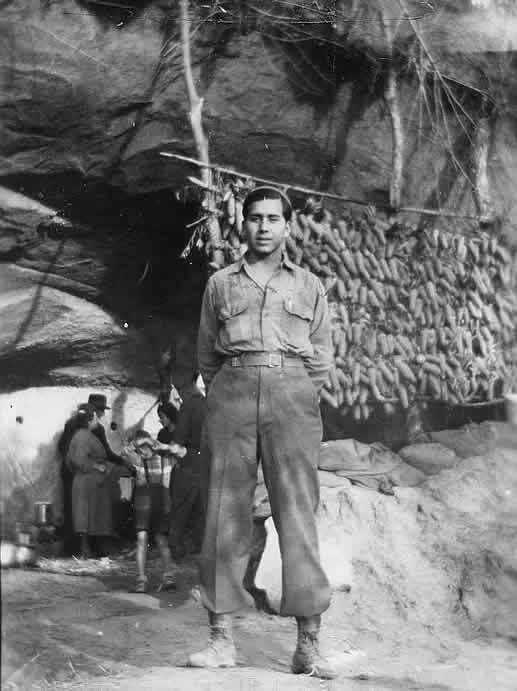 He then was employed at the Armours packing house, before his years in the U.S. Army starting at the age of 20 in 1942. 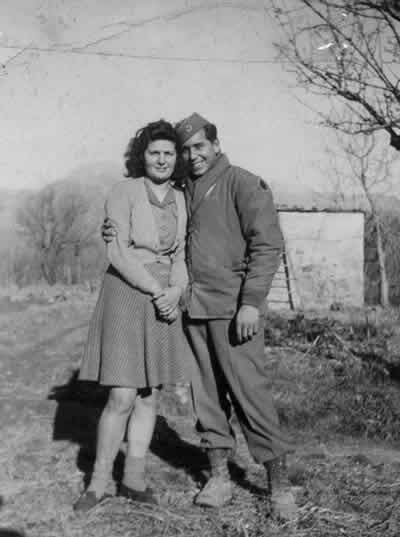 Roque Riojas was one of many men and women who served in the U.S. Army during World War II. 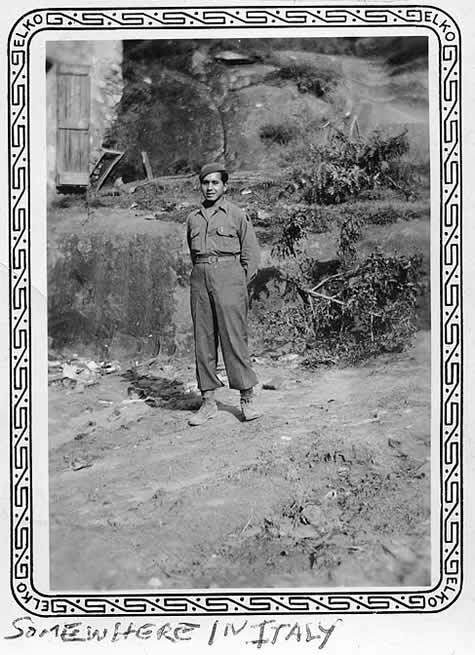 He served in North Africa and Italy with the 135th Infantry Regiment, 34th Division from March 1943 to October 1945. 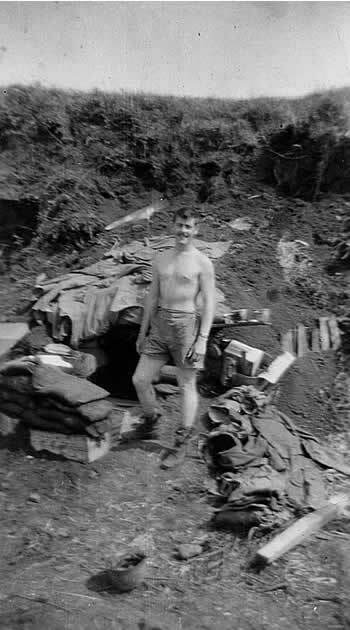 He was awarded the Good Conduct Medal, Marksmanship Medal with the M-1 Rifle, Rifle Grenade, Bars, MO Service Medal, Combat Infantry Badge, Bronze Star, Purple Heart and European-African-Middle Eastern Theater Medal with five Battle Stars. The 34th Division, became an Association, when it was deactivated in 1946. Currently, Riojas is a member of the Kansas City Metro Chapter of the American GI Forum. The chapter membership were very proud to learn of Roque Riojas becoming the first Hispanic to lead the Red Bull Division as it's President, starting in September 2006. 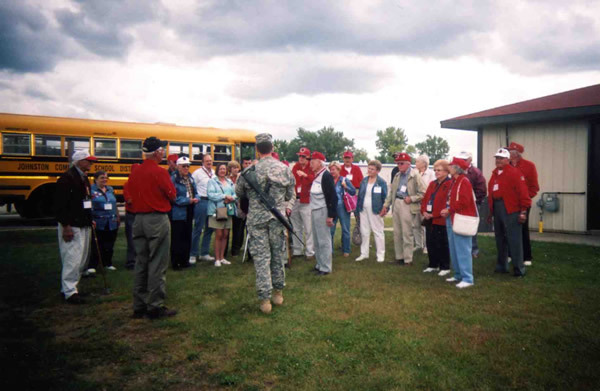 The 34th Infantry Division led all divisions in the total days of combat. Over 600 days of battle in difficult terrain. Making their way up the mountains of Italy, in most instances this required the use of mule trains, (20 to 25 mules) to aid in the movement of much-needed supplies. 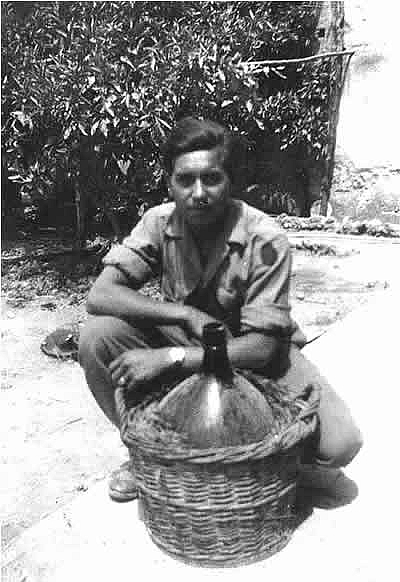 Of his wartime experiences, Riojas finds it difficult to compare each battle. 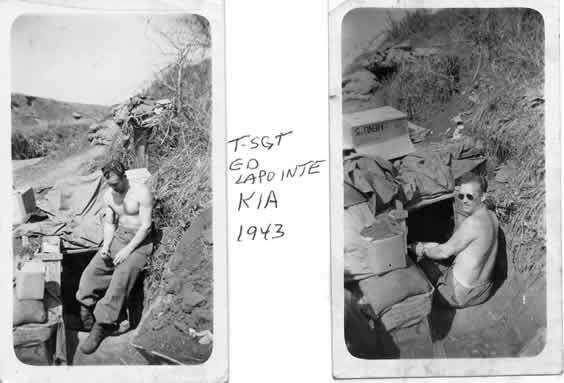 “Kasserine Pass, Said Pass, Hill 609 North Africa or Salerno, Benevento, Mt. 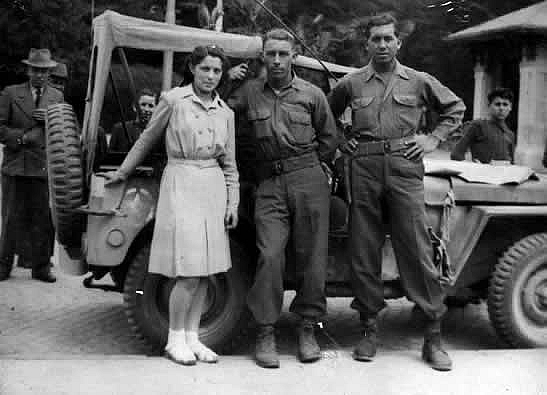 Pantano, the town of Cassino, Monte Cassino, Anzio, Po Valley or Bologna.” They were all important battles to be won against the enemy. Riojas, the young man from Kansas City, Kansas was making his mark. When asked for more information, he remembers his food as C and K rations and just enough water to drink in those 600 days of combat. On rare occasions they had showers and hot food available. 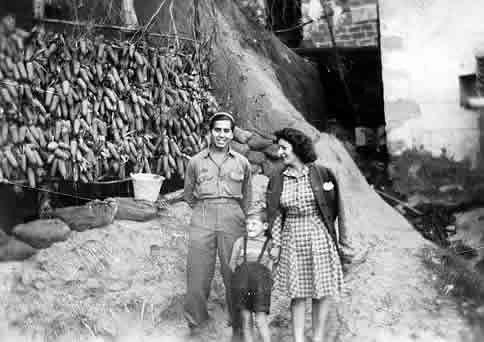 Upon his return to Kansas City, Roque married and had a family. As fate would have it, he divorced and moved to St. Louis, Missouri where he was employed by the Norfolk Western Rail Road. He also moved to Illinois until 1998, when he returned to Kansas City. It was here that he “met a beautiful lady. 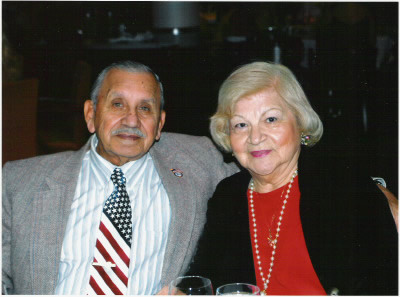 Her name was Elizabeth Castilleja.” They wed a year later. One of the highlights of his life was traveling to Washington, DC in 2004 to be present at the dedication of the National World War II Memorial. 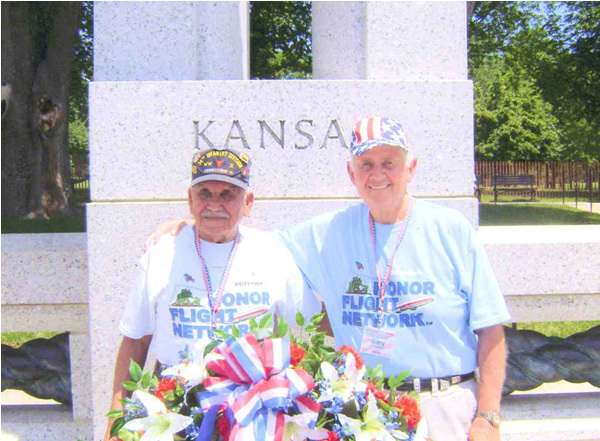 He also was there to represent the Kansas American GI Forum. While there, he met old friends and former foes. During that trip, he was also a guest of President George W. Bush and the First Lady. Rudy Padilla can be contacted at opkansas@swbell.net . "I just recv'd this today and took me by surprise. That is General Charles Bolte of the 34th Divn. 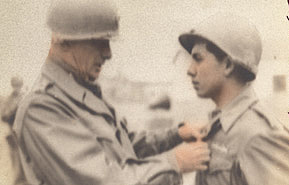 pinning the Bronze Star Medal on me, just after I came around the hay stack..." I just wanted to share this with you." This was taken Sat. 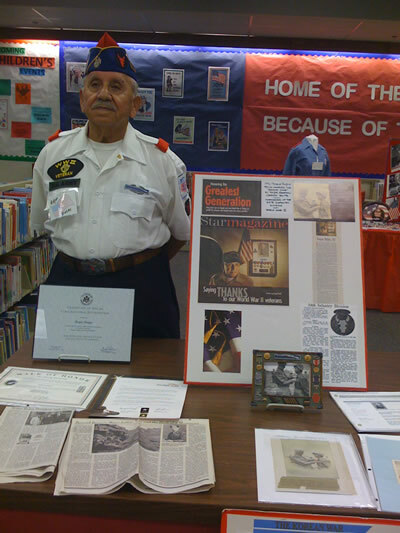 Nov. 1 at a gathering of veterans at the Public Library in Gladstone, Mo. I did two interviews and one will be sent to the Library of Congress, Wash. D.C.
Group which attended 2008 Reunion. Taken at Gold Star Museum. Rocky on far right.